Toys R Us is going all out for the holidays, opening over 600 new pop-up stores and hiring at least 10,000 people to expand its base for the biggest shopping season. "We're not projecting a dramatic increase in the [economic] environment. We're saying Christmas will come," said CEO Jerry Storch. "What I need to do is make sure we're stocked up with the right product for Christmas . . . if that's being optimistic, great." Toys R Us announced it will leverage last year's acquisition of FAO Schwarz by opening 10 pop-up stores in malls for the holiday season, carrying a limited selection of classic toys from the New York City store. The stores will be located in malls in affluent neighborhoods, including some which had previously housed FAO locations before the exclusive toy store declared bankruptcy in 2003. Locations include Tysons Galleria in McLean, Va., and Garden State Plaza in Paramus, N.J. The FAO stores will be 2,500 square feet, slightly smaller than the 4,000-square-foot Toys R Us Express pop-up stores that will also open for the season in malls nationwide. 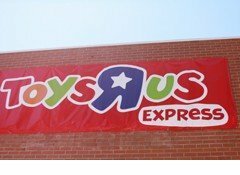 Toys R Us had previously announced it will open 600 pop-up Toys R Us Express stores this holiday season, following the success of the 90 stores it opened last year. Two-thirds of those stores remain open now, thanks to their success driving mall traffic and sales, and many of this year's crop may also stay open year-round, said Storch. He noted the expansion will require the company to hire 10,000 seasonal employees to staff those stores. The company opened eight outlet stores over the summer, selling both discounted merchandise from its stores and value-priced items specifically made for the outlets. The stores are an offshoot of the pop-ups done last year, and a way to capitalize on the growing popularity of outlet shopping among cash-conscious shoppers, said Storch. Storch acknowledged the recent headlines that hint at a double dip into recession, but said his company makes the bulk of its profits during the holiday season, so holding back is not an option. After showing 4.6% comparable sales growth in the fourth quarter last year, even with difficult conditions, Toys R Us is looking forward to a strong holiday. "I don't think anyone believes the environment here is worse than last year," said Storch. Even in the worst of times, gifts for children are the last thing parents cut and they will pay the price for the hot toy if they can find it, said Storch. The company expects to release its forecast of the hot toys for this season later this month. It had a good run last year with the Zhu Zhu Pets, which became the seasonal craze that had parents lined up in stores. It's also increased its exclusive toy distribution deals for the holiday, so it is the only source for several upcoming toys such as the Christmas in Toy Town train set from Fisher Price, Air Hogs Pocket Copters from Spin Master and the Phineas and Ferb Acoustic Guitar from First Act. The company had gone a long way toward resolving the operational issues that had hobbled it for most of the decade, leading to a 2005 leveraged buyout by a group led by Bain Capital Partners, Kohlberg Kravis Roberts & Co. and Vornado Realty Trust. Management is now preparing for an initial public offering earmarked to pay down some of its $5.2 billion in debt. Storch wouldn't comment on the IPO, but said the company is in a sound fiscal position, having just completed refinancing two of its debt issues with improving terms. Toys R Us had nearly $2 billion in debt maturing before the end of fiscal 2012, Also, Storch noted the company posted $312 million in net income last year, a 43% increase from 2008, which was also an up year, despite the difficult economy. Toys R Us can afford to make bold moves, Storch said. He denied that competition from big-box stores is a factor, despite the promotional kick discounters such as Wal-Mart (WMT) and Target (TGT) got from $10 toy offers last season. By putting stores in malls, where they're more accessible to shoppers, Toys R US is planning to leverage its brand as the one place to find all the hot toys against big boxes, he said. "Now is the time to be aggressive," said Storch. "The option is to be pushed back."